Sitting across from Rep. Alexandria Ocasio-Cortez, D-N.Y., Anderson Cooper appeared somewhat hesitant to pose his next question. "Do you believe President Trump is a racist?" Cooper asked haltingly during a "60 Minutes" interview with the 29-year-old congresswoman that aired Sunday. Ocasio-Cortez, however, didn't pause before responding firmly: "Yeah. Yeah. No question." The exchange has since gone viral with many praising Ocasio-Cortez for yet another moment of uninhibited candor while others were quick to criticize Cooper's questions, specifically drawing attention to when he asked the young congresswoman about how she can say the president is a racist. In response to Ocasio-Cortez, the White House told "60 Minutes" that the congresswoman's "sheer ignorance on the matter can't cover the fact that President Trump supported and passed historic criminal justice reform," adding that Trump has also "repeatedly condemned racism and bigotry in all forms." The interview's turn to Trump began with the pair discussing the backlash Ocasio-Cortez has faced for making factual mistakes in public statements. Last week, The Washington Post's Fact Checker blog awarded her four Pinocchios for a misleading tweet referencing a report on the Pentagon's financial practices. Ocasio-Cortez took the opportunity to distance herself from another prominent politician who has been frequently accused of spreading misinformation: Trump. "Whenever I make a mistake, I say, 'Okay, this was clumsy,' and then I restate what my point was," she said. "But it's not the same thing as the president lying about immigrants. It's not the same thing at all." Cooper pointed out that Ocasio-Cortez doesn't talk about the president often and asked her why. "Because I think he's a symptom of a problem," she said. After Cooper pressed her to explain, she added, "The president certainly didn't invent racism, but he's certainly given a voice to it, and expanded it, and created a platform for those things." 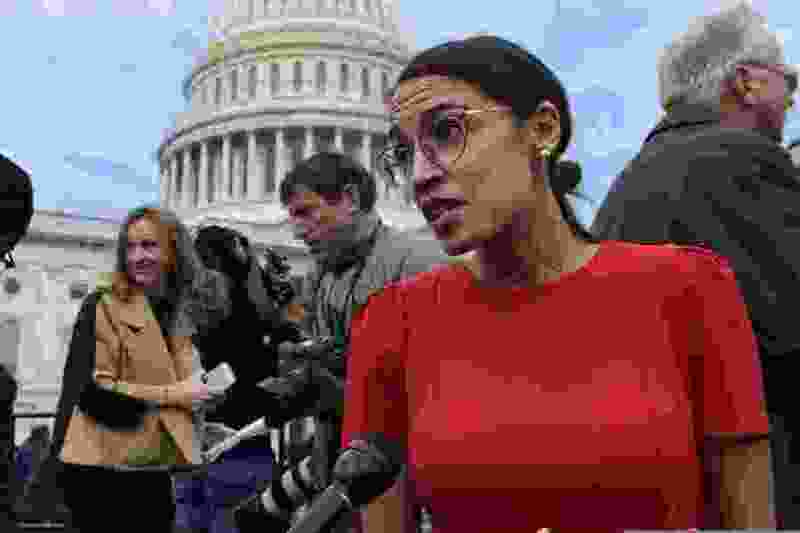 Then, Cooper asked Ocasio-Cortez if she thinks the president “is a racist,” to which the new congresswoman responded authoritatively with the succinct four-word answer that threw the Internet into a frenzy. For many, Ocasio-Cortez's declaration about Trump, who repeatedly has been accused of being racist, was not surprising. Several people tweeted her remark was no different from saying the "sky is blue." But Cooper had a follow-up question. "When you look at the words that he uses, which are historic dog whistles of white supremacy," she responded, "when you look at how he reacted to the Charlottesville incident where neo-Nazis murdered a woman versus how he manufactures crises, like immigrants seeking legal refuge on our borders, it's night and day." Last year, Trump drew widespread condemnation for reportedly referring to Haiti, El Salvador and African nations as “shithole countries.” In August, former White House aide Omarosa Manigault Newman released audio on “CBS This Morning” that was said to be of her and two other black Trump campaign staffers talking about the alleged existence of a tape that captured Trump using the n-word, The Post reported. The president denied ever using the racial slur, tweeting that it is “a terrible and disgusting” word. More recently, Trump was slammed for promoting a GOP campaign ad critics likened to the infamous “Willie Horton” ads supporting George H.W. Bush in the 1988 presidential election. Beyond the White House's statement to "60 Minutes," conservatives also rushed to defend the president. Though Ocasio-Cortez seemed unbothered by Cooper's interview technique, his questions rankled some. Some recalled that just about a year ago, Cooper slammed the president's "shithole countries" comment on his CNN show, calling it a "racist sentiment." "Not racial. Not racially charged. Racist," Cooper said at the time. "Let's not pretend or dance around it." Others supported Cooper, arguing that the veteran journalist was simply doing his job. "He's not there to agree with Ocasio, even if deep inside he does agree with her," one person tweeted. "He wants to find out why she thinks Trump is racist, even though he might already know the answer." One person blamed the "flaw of the medium," referencing a clip of the interview that included subtitles.